Light Music is a mix of musical styles, somewhere a cross between popular and classical music. The rule book for light music is a bit fuzzy, but in general it covers a large family of tunes; usually short, highly melodic pieces, some original and some take-offs from previous works such as show tunes, ballets and waltzes. Usually heavy on the strings, often playful and whimsical, sometimes dreamy and trance-inducing, the arrangements are generally entirely instrumental. Light music was popular during the 1950’s through 1960’s and filled a niche for background and easy listening music. It is music that was created to be immediately enjoyed upon listening, like candy for the ear, without a lot of thought required to delight the listener. 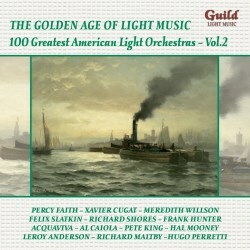 Guild has produced an impressive library of light music collected from past years, and this disc is part of their series. In the United States there were many large orchestras that played light music, and 25 of them are featured here (see review of Volume 1). Some of them are well-known; Leroy Anderson and his Concert Orchestra perform the lovely Serenata, one of Anderson’s many compositions, first written in 1947 and recorded and released by Decca in 1959. The brass band boldly complements the full string section, while the castanets keep the quick Latin rhythm moving briskly. Another popular group, Percy Faith and His Orchestra, are featured on La Cucaracha, a traditional Latin favorite, which was originally recorded in 1957 for Columbia Records. Played in both cha-cha and swing beats, the band members provide amazing sound effects on their instruments; birds laughing, crickets chirping, and some noises left to the imagination. A lesser-known group, Felix Slatkin and His Orchestra, perform a nice relaxed arrangement of the Harold Arlen/Johnny Mercer song Easy Street, originally released by Liberty Records in 1961 on the Street Scene album. Curiously, the liner notes credit a “Jones” as the composer. Another lovely tune is Irving Berlin’s The Girl That I Marry, from the 1946 musical Annie Get Your Gun, performed by Glenn Osser and his Orchestra, a gentle waltz played with great effect with violins, harp and a touch of bells. Another of my favorites is from the Kurt Weill songbook; Green Up Time, written for the 1948 musical Love Life, and performed by the Warner Brothers Orchestra conducted by Maurice Levine, from a 1959 Warner Brothers records release. Unfortunately, the wonderful lyrics by Alan Jay Lerner to this tune are not included here. This disc is a great addition to anyone’s Light Music collection. The sound quality is excellent, and a very informative 12- page booklet is included with the disc.